GLASGOW, Scotland — “My mother was born in the Hebrides, in Stornoway, so that’s serious Scotland,” Donald Trump told an interviewer in 2010. The U.S. presidential candidate has long made much of his Scottish roots. He likes Scotland so much that he chose Aberdeenshire as the location for a controversial £1 billion golfing complex. The Herald, one of Scotland’s largest newspapers, carried a front page advert Tuesday for another of Trump’s Scottish golfing interests, at Turnberry. By Wednesday, almost all of Scotland’s political establishment, and even its universities, had made clear their disapproval of Trump’s latest outburst. Robert Gordon University in Aberdeen stripped Trump of an honorary degree awarded in 2010, describing his comments as “wholly incompatible” with its values. By Wednesday, almost all of Scotland’s political establishment, and even its universities, had made clear their disapproval of Trump’s latest outburst. Trump’s comments were “divisive, hateful and designed to cause division between communities,” Yousaf said. “This bigoted blowhard of a man is being rightly condemned far and wide, and I’m confident that Scotland will reject his extremist rhetoric,” said Harvie, who had previously clashed with Trump over a proposed wind farm near the Aberdeenshire golf course. In light of the Republican hopeful’s latest remarks, Harvie said he could not imagine any “self-respecting person wanting to spend money” in any of Trump’s business interests in Scotland. Scottish ministers and Scottish National Party MPs urged Theresa May, the U.K. home secretary, to consider banning Trump from traveling to the U.K.
“While we cannot control what he says on U.S. soil, we can demonstrate leadership in relation to this issue and say: Not in the United Kingdom do we want people making Islamophobic, racist, anti-Muslim remarks that are completely unfounded and unhelpful when we continue our fight against terrorism,” the Scottish MP, who is Muslim, said. The Scottish government, and the Scottish National Party, have not always held Trump in such low esteem. Back in 2008, the Edinburgh administration stepped in when Aberdeenshire Council rejected Trump’s bid for planning permission for his £1 billion luxury golfing complex. Construction of the sprawling development on the scenic Aberdeenshire coast went ahead in the face of vociferous local opposition. Trump and then Scottish first minister and SNP leader Alex Salmond were on good terms, with the pair photographed together on a number of occasions. But the relationship turned sour after a decision was made to build 11 wind turbines near the golf course. The Apprentice star went on to take out adverts comparing the development of wind farms to the Lockerbie bombing, which killed 259 passengers on board Pan Am Flight 103 and 11 residents of the Scottish town in 1989. In June, an Edinburgh court dismissed Trump’s request for a public inquiry into what he says was the Scottish government’s unfair approval for the wind power project. Scottish judges concluded Trump’s lawyers had not come “anywhere near” substantiating his suspicions. 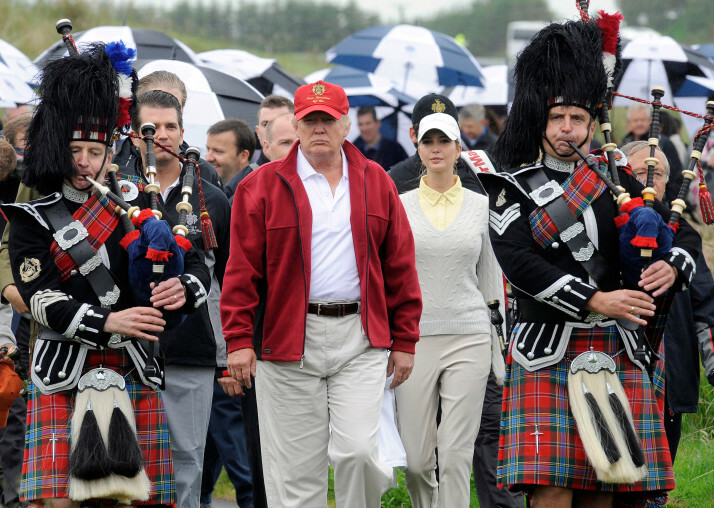 Trump’s investment in Aberdeenshire has so far been much less substantial than originally billed and he has repeatedly declined to say when he might start planned construction on a second golf course, hotel expansion and more than 2,000 holiday and residential homes. “The Trump organization has now been beaten twice in the Scottish courts and I hope that he will now accept the decision with good grace,” he said. Next Next post: Will Northern Ireland’s Peacewalls Ever Come Down?